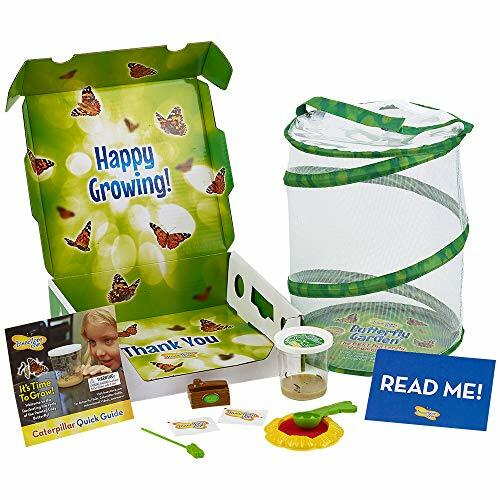 This butterfly kit now includes a deluxe Chrysalis station and Insect Lore butterfly feeder! See tiny caterpillars grow, grow, grow into butterflies! 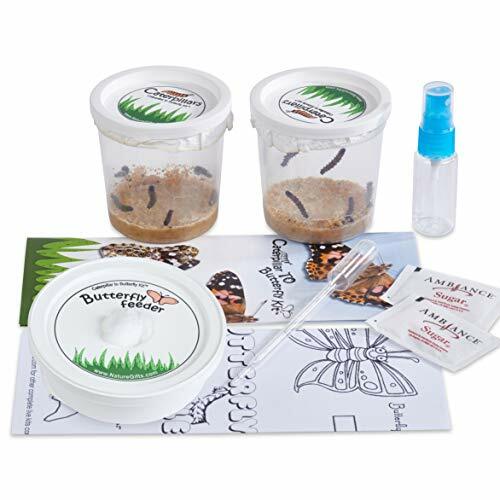 kids can observe the butterfly life cycle up close with this butterfly kit from Insect Lore. 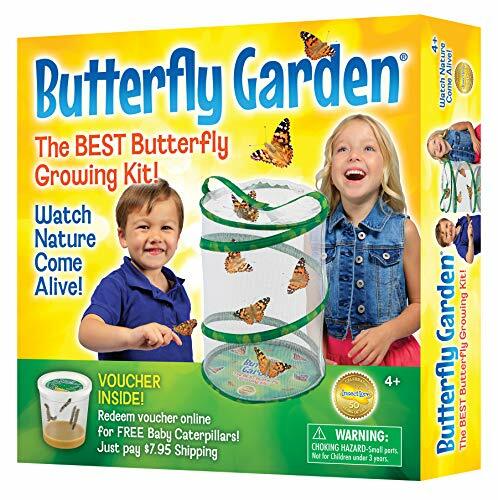 A family and teacher favorite for almost 50 years, the butterfly garden with live lets you begin the project the day the box arrives at your door. 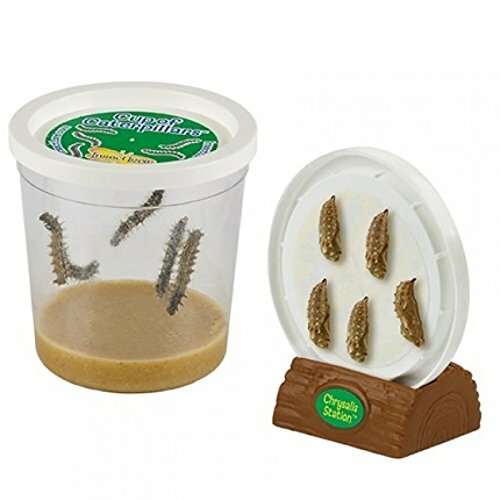 It comes with 5 baby caterpillars and everything you need to get them growing! the entire metamorphosis takes about 3 weeks. Watch them transform from caterpillars to chrysalides, to beautiful butterflies - then let them go! ages 4+ please note: this item contains live insects. We guarantee that at least 3 of your caterpillars will develop into healthy butterflies. Shipping: live caterpillars are shipped to destinations within the Continental USA and Alaska. We cannot ship live caterpillars to Hawaii.IMPORTANT NOTE! Please postpone your live order if daytime temperatures in your area are below 55 degrees or above 85 degrees Fahrenheit. Your caterpillars may not survive their journey to you in extreme heat or cold. 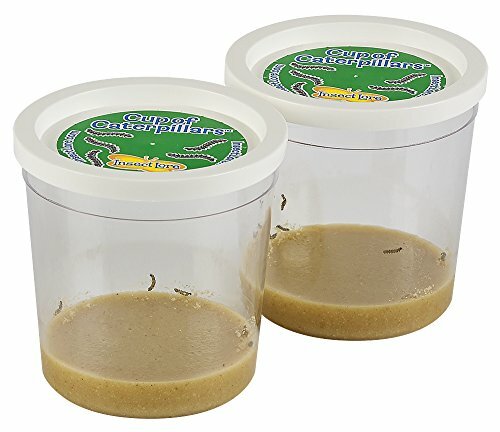 Our 2 cups of live caterpillars includes 2 cups of 5 caterpillars - that's 10 caterpillars in total! Your caterpillars will also come with all of the caterpillar food they need to become beautiful painted Lady butterflies.Important note! Please postpone your live order if daytime temperatures in your area are below 55 degrees or above 85 degrees Fahrenheit. Your caterpillars may not survive their journey to you in extreme heat or cold. 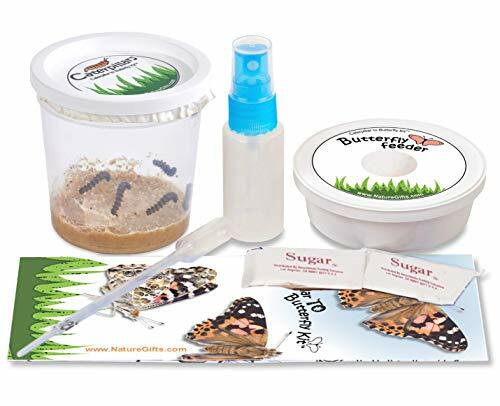 10 Painted Lady Butterfly Caterpillars (5 each in 2 cups) with food and easy instructions. Order ANY time of year- a Fun Winter Project! Instructions included how to keep butterflies inside for their life cycle. 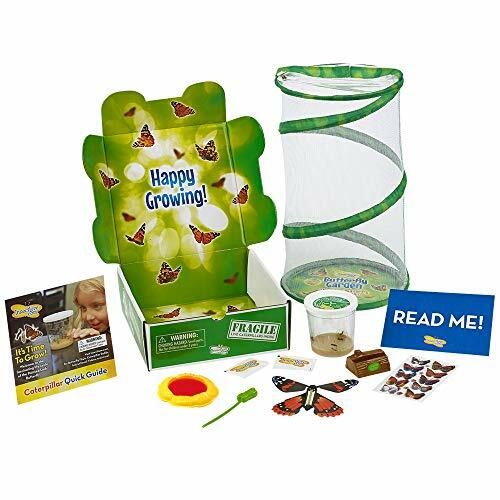 Comes with: 10 caterpillars sent now, food, Mister, butterfly feeder, sugar, eye dropper, easy instructions, coloring page. Guaranteed! We guarantee 6 caterpillars to become happy adult butterflies. You can release them outside after observing them if it's over 50 degrees. DO NOT ORDER if below 40 degrees or above 85 degrees in your area. Our live arrival guaranty will be void if ordered during these temperatures. YOU ARE RESPONSIBLE FOR CHECKING TEMPERATURES IN YOUR AREA to be sure your caterpillars arrive alive. We ship this item via USPS (post office) within 4 business days. 5 Painted Lady Butterfly Caterpillars (in 1 cup) with food and easy instructions. Order ANY time of year- a Fun Winter Project! Instructions included how to keep butterflies inside for their life cycle. 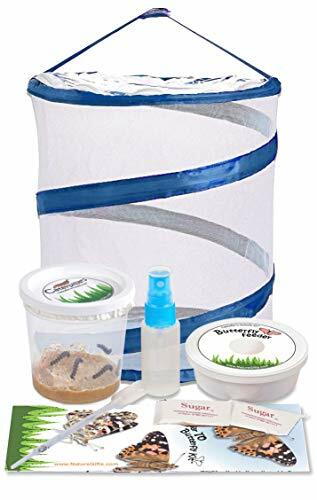 Comes with: 5 caterpillars sent now, food, Mister, butterfly feeder, sugar, eye dropper, easy instructions, coloring page. Guaranteed! We guarantee at least 3 caterpillars to become happy adult butterflies. You can release them outside after observing them if it's over 50 degrees. Please DO NOT ORDER if below 40 degrees or above 85 degrees in your area. Our live arrival guaranty will be void if ordered during these temperatures. YOU ARE RESPONSIBLE FOR CHECKING TEMPERATURES IN YOUR AREA to be sure your caterpillars arrive alive. We ship this item via USPS (post office) within 4 business days. A walk-through of Insect Lore's flagship Painted lady butterfly raising kit: The Live Butterfly Garden. Students in 2nd Grade at Lindo Park School in Lakeside, CA observed the Life Cycle of the Painted Lady Butterfly. In this movie, students can see the life cycle take place right before their eyes by watching time lapse footage beginning with caterpillars all the way to butterflies. Teacher Kay Little filmed the life cycle using an iPod Touch and the TimeLapse app.